With a blizzard on our door step, we want to encourage residents to be prepared. Reach out to friends, family and neighbors to help those who may need assistance during or after the storm. With power outages likely, now is the time to move those who require assistance, not during the storm. With anticipated snow accumulations up to 3 inches/hour, plows may not be able to keep roads clear, which means emergency services may have difficulty getting to those in need. If you have an emergency, as always, dial 911. Use caution when using generators as carbon monoxide poisoning and/or fires often occur due to misuse. 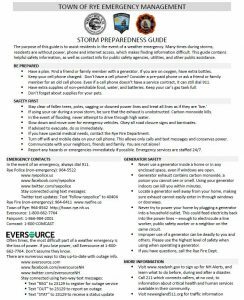 Download the Storm Preparedness Guide below for additional information.